Sole search no more. With the magic of Macy’s you’ll find yourself swallowed up in a sea of stylish shoes that will kick up your casual favorites and pump up party dresses all while sticking to your budget. Featuring on trend brands such as Jessica Simpson, Betsey Johnson, Nine West, MICHAEL Michael Kors and more there’s a solemate for everyone. Check out my Macy’s must-haves below featuring coveted classics and edgy exclusives for signature styles that will update your wardrobe with just one step. Get the point? With pointed toe pumps receiving a resurgence this fall it’s time to update your work week pumps with this 90s inspired shape that will elongate your legs and add serious power dressing appeal. Look for signature prints like monochrome houndstooth, classic animal prints and rainbow bright details to add interest to solid separates. 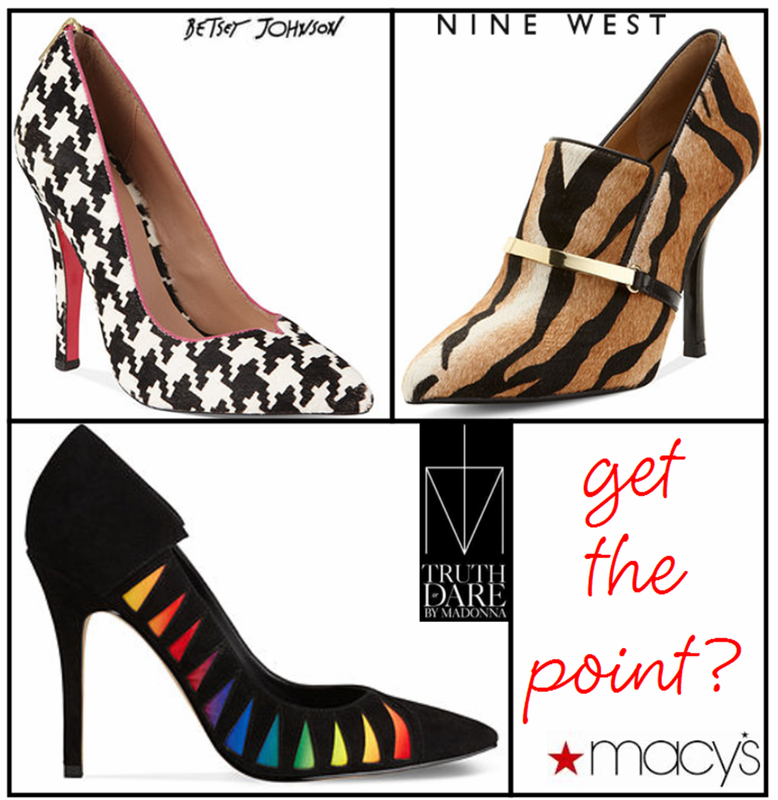 So stay ahead of the style curve and purchase on of these fashion forward heels at Macy’s, today. No need for style horror stories, with the shining selection of party pumps from Macy’s you’ll be headed for disco decadence. These high shine heels from featuring crystals, gemstones and glitter will add the quintessential holiday shimmer and with comfortable platforms and padded soles there’s no need to worry about screaming feet. Add just the right amount of glitz and glamour to your favorite little black dress with one of these glittering picks that go from fun and youthful to sleek and sophisticated. Get ready for boot camp with basic combat styles to luxe thigh high designs. A staple of the season you really can’t go wrong with a pair of boots. 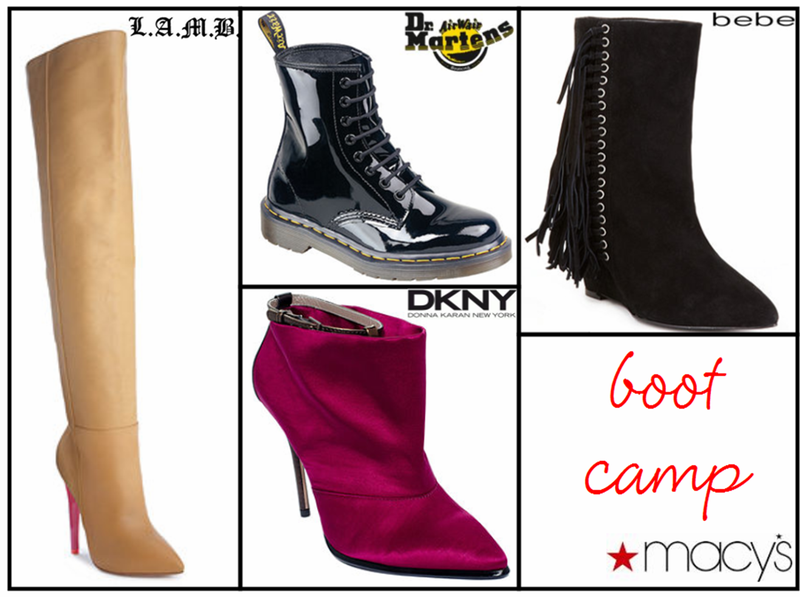 Whether you splurge on a pair of towering designer beauties or modern looking booties there’s a signature style for everyone at Macy’s. Finish off a casual look with these fun fringed wedges by bebe, or add some jewel tone shine with these satin raspberry booties by DKNY. And for a versatile style that will go from slushy winter streets to muddy festival grounds an iconic pair of Dr. Martens is the only way to go. With the holidays approaching and winter just one snow storm away it’s time to stock up on party pumps and versatile boots that will kick up your cold weather favorites. And with name brands and exclusive styles Macy’s is your go-to destination for finding your next solemate.